While it may require patience and a little extra clean-up (ok, often it's really a lot of clean-up), getting kids involved in the kitchen is a great opportunity to teach them valuable skills and spend time together. It may be hard to take time out of the busy day or weekend, but it’s well worth the effort. For me it's a great way to get my kids disconnected from the TV, electronic games, cell phones and the lot, and to engage them in something they can actually make and eat. It's good now, and hopefully it will be useful for them in the future, when they grow up and become independent. 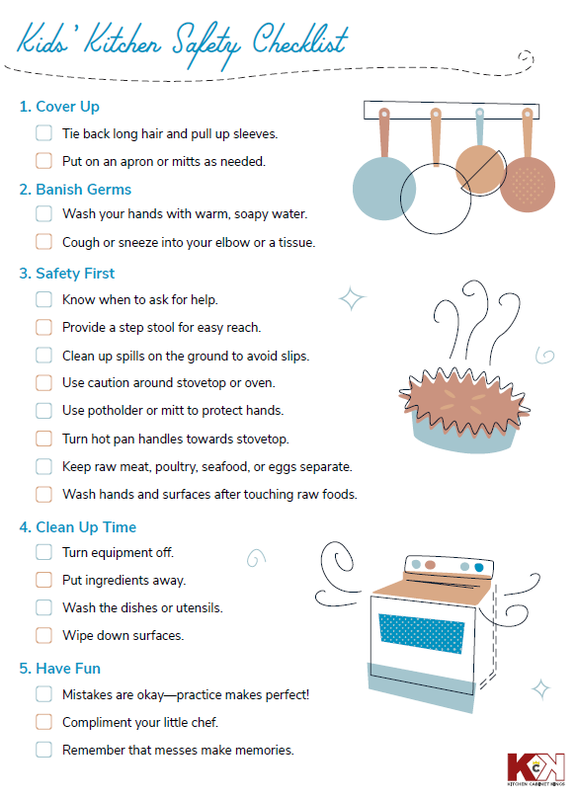 This family kitchen time is also the perfect opportunity to teach kids basic hygiene and safety rules, and that's why Kitchen Cabinet Kings prepared a useful and fun kitchen safety checklist. Cooking as a family can encourage children to experiment with new foods and provide healthier meals for everyone (our rule is - they make it, they eat it). Little ones feel like they are contributing in a positive way. So we should involve them in the process from start to finish: meal planning, shopping and food prep. What's the best way to do it? Be sure to start with an easy recipe. Washing the veggies, measuring out recipe ingredients, and stirring are great steps for your kids to accomplish. Always keep safety top of mind when your kids are in the kitchen. Between the hot oven, knives, and appliances, it can be a dangerous place for kids! 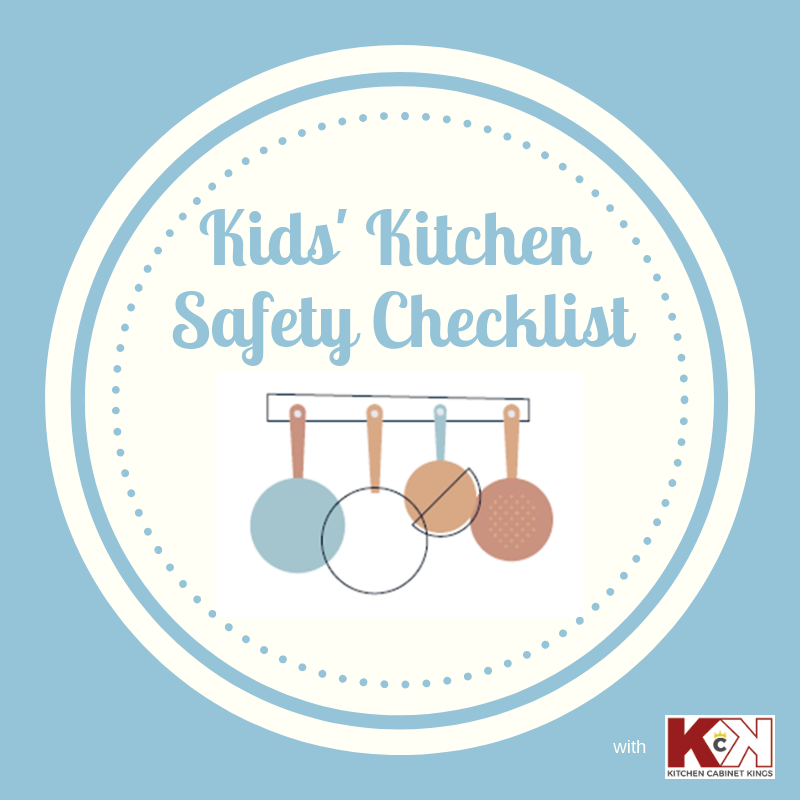 So, before you get started cooking with your kids, run through this helpful and adorable kitchen safety checklist put together by Kitchen Cabinet Kings with them and make their kitchen experience memorable. As you can see, all the relevant steps are covered. Explain each step to your kids and most importantly, have fun throughout the process. This post was written in partnership with Kitchen Cabinet Kings All images were supplied by them and as such are not owned by me. I know what you mean. I still have a scar on the back of my hand from burning it with boiling water when I was six or seven. I love to have my kids in the kitchen with me, but safety is really important.